Every year for the past three, we’ve celebrated the dying days of summer with the family somewhere in Italy. To date it’s been the Amalfi Coast, then Sicily, and this year Sardinia. We basked in turquoise waters, soaked up the last rays of sun, quaffed fragrant Vermentino di Gallura and explosive Cannonau (aka Garnacha/Grenache) and committed to the barbecue what must have been the priciest fish ever purchased (at least by me) – a dentice, since you ask, and delicious he was too. He weighed in at over 2 kilos and fed 7 of us handsomely for one meal with enough leftovers for a fish salad with avocado, ceviche-style. 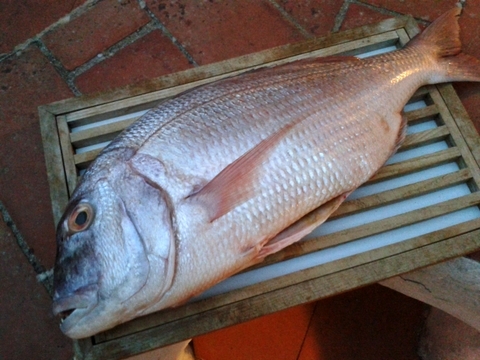 The bones went to make a memorable stock which perfumed a risotto alle vongole next day. Here he is before he hit the fire. We ate wonderfully well – food is, unsurprisingly, rather a priority for us all on holiday. We all love cooking, so eating in is no hardship. But when we ate out, I admit it was a bit disappointing not to find much local food, dishes bearing the stamp of the island and its culinary traditions – not least because I had scheduled A Taste of Sardinia workshop on my return. 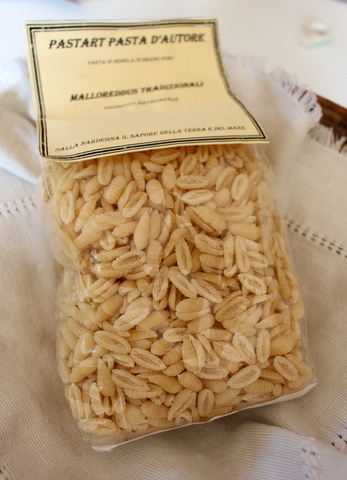 The little multi-purpose grocery shop nearby had neat little packs of durum-wheat, no-egg pastas like fregola, little lentil-sized dots, and maloreddus, shaped like tiny cowry shells – almost too beautiful to cook/eat. Yet in the local trattorie there was no sign of this kind of pasta – or anything that felt at all tipico. In the bookshop in Palau I found a great little book entitled Le Buone Ricette Sardegna, full of ideas for cooking fregola with shellfish, or maloreddus with sausage and wild mushrooms. How to track down this kind of cooking, dishes that spoke and smelled of the island? To the rescue came Sarah, fount of all local knowledge and general factotum for our villa. 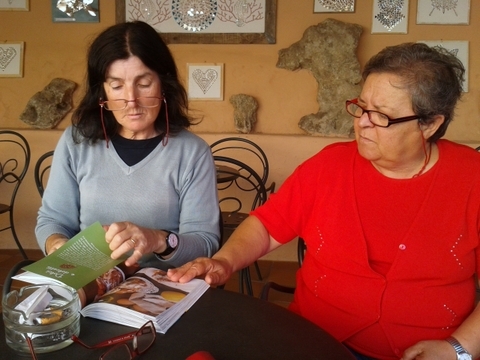 She set up a meeting with two wonderful ladies named Anna Maria and Giuseppina, to talk local food. They started by apologising for the fact that they were not chefs but practised home cooks – just what I’d hoped for. We leafed through the book together and they exclaimed over the different recipes, which they approved as thoroughly authentic (and gave me lovely ones of their own). How come there was so little of this kind of food served in restaurants? They looked baffled, then suggested that fregola, maloreddus & Co. is home cooking, not cheffy stuff and definitely not considered fancy enough to be served in restaurants. Nothing for it, I’d have to create my own tastes of Sardinia. 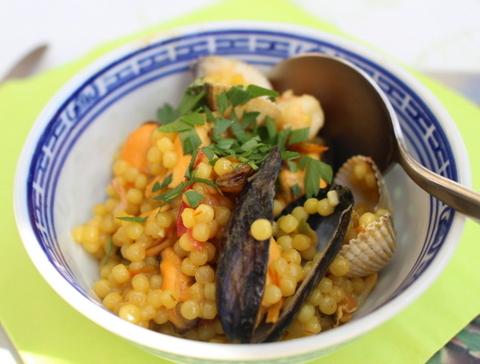 Back home, I made this little soup-stew of fregola with shellfish and saffron. It featured at last week’s workshop, and we feasted on it (and lots of other dishes) on the terrace. 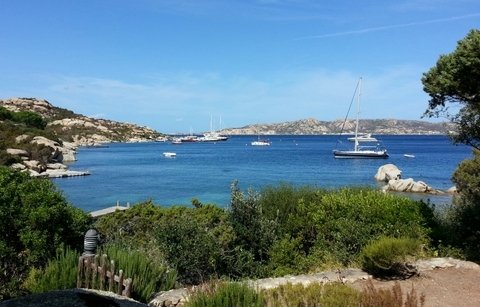 We didn’t have the turquoise water below the house, but it was a glorious Indian summer day, worthy of Sardinia. 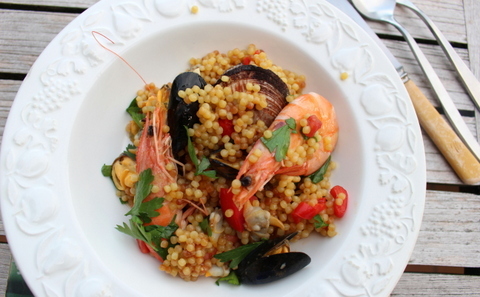 If you can’t find fregola, substitute mograbieh, Israeli couscous or acini di pepe. Here it’s cooked a bit like risotto, with just enough fish stock for the pasta to absorb, and shellfish stirred in at the end. You can cook the mussels and cockles ahead, shell them (leave some in their shells as a colourful garnish) and refrigerate them. Then cook the pasta as for risotto, adding the shellfish at the end to heat through. Pull the beards out of the mussels (if not already cleaned) and give them a good scrub. 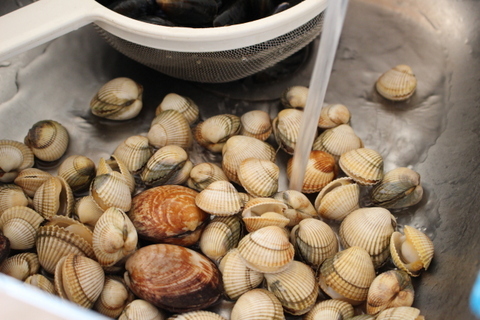 Put the cockles in a large bowl, cover generously with cold water and add a handful of coarse salt. Swish them around vigorously and leave for a few hours so they release their sand, lifting and swirling them around from time to time and changing the water once or twice. Drain. 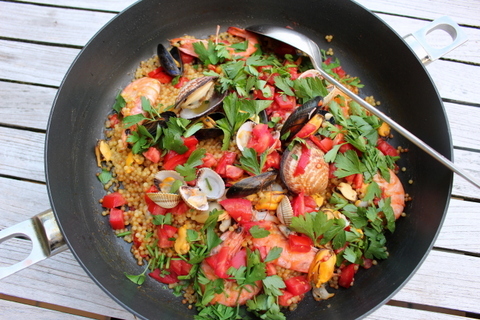 Tip the drained shellfish into a large frying pan or paella pan, cover and cook (no added liquid) over lively heat, shaking from time to time, till all the shellfish are gaping open – about 5-6’. Set a colander over a bowl and tip in the shellfish (reserve the pan for later). 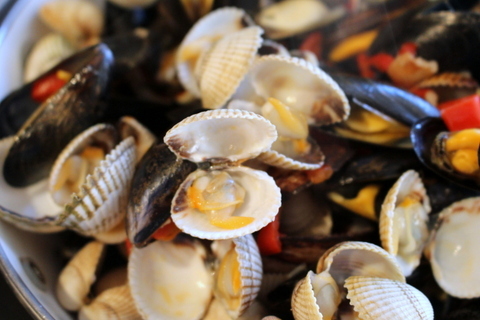 Remove almost all the shellfish from shells – leave a few un-shelled for the garnish. Strain the shellfish cooking juices into a saucepan through a muslin or fine cloth to remove sand, add the fish stock and saffron and bring to a simmer. In the reserved frying pan or paella pan heat 1 tablespoon of oil and soften the chopped chile and garlic without allowing them to brown. Stir in the pasta and let it toast lightly and take a bit of colour. Pour in 1 cup of hot fish stock and cook till absorbed. Add 1 more cup and continue cooking till all the stock is absorbed and the pasta just tender to the bite and nicely plumped up (about 10 minutes). Spoon into soup bowls, sprinkle with chopped parsley and add a drizzle of olive oil. This recipe sounds fascinating. Although I’ve had fregola once, either at a restaurant or a friend’s house, I’ve never cooked with it. So I picked up some at a local Italian grocer, and plan to give this a try. Hi Bob – well done you, please let me know how you get on with your fregola! This sounds delicious. I can get the fregola in Wholefoods or a local Italian store in Portland so will have a solo workshop and produce it for Shelly and Gregg. Bright and sunny here but getting too cold to eat on any terrace or deck unfortunately. Assuming it’s Portland Maine rather than Portland Oregon, you can still eat dinner out on the porch or deck on some nights. We did last night and expect to do so tonight. OK, maybe we’re crazy, but there’s a long winter ahead. Definitely Maine, not Oregon – seems like you guys should meet!